As a booking agent for Bonita Norris we can arrange for Mountaineer Bonita Norris to inspire your audience. Bonita Norris is not only the youngest British woman to reach the top of Mt Everest; she accomplished it with no previous climbing experience! Booking Bonita Norris will leave your audience inspired to overcome their own personal mountains. Bonita has climbed the world’s highest mountains and skied to the North pole and she will delight audiences with her rivetingly rocky journey from a novice climbing wall to 29,029 feet above sea level. Enter Bonita Norris: the youngest British woman to conquer the mighty peak, who delights audiences with her rivetingly rocky journey from novice climber to (pretty much) the top of the world. Bonita’s story reveals the power of small steps, and maybe some stubbed toes on the way. From a life-changing phone call to an indoor climbing wall to the tallest summit above sea level… Bonita Norris’ journey translates to the highs and lows we experience in our everyday lives. 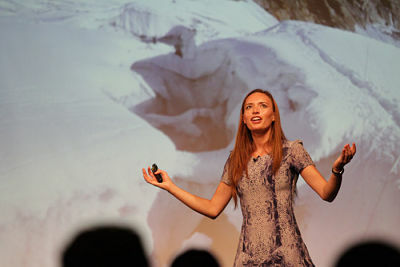 Now a motivational speaker herself, Bonita Norris was inspired to invest in some extra grippy mountaineering boots at the age of 20 following a university lecture. As she listened to two men describe their own experiences, her interest piqued and she resolved that very day to observe the curvature of the earth with her own eyes: we’ve heard the view is much better from 29,029 feet. Decision made, there was now just the minor issue of never having climbed before. And needing exceptionally high fitness levels to survive unforgiving environmental conditions. Oh, and £50,000 to secure her place on an expedition. Right in the midst of a Media Arts degree, the young woman from Wokingman set about to train and raise funds for her dream. Overnight, she had to become an entrepreneur and athlete with no resources or skills. A profoundly personal challenge, Bonita Norris drew on the deepest reserves of her courage and willpower to persevere until, incredibly, she found a sponsor and completed her training. On the 17th of May 2010, at the age of 22, Bonita Norris took a record-breaking step onto the top of Everest. And she did not stop there. Since then, this humble and passionate individual has skiied to the North Pole, led charity teams, and climbed a total of five Himalayan peaks—three of which are over 8000m high. An icon for British adventurers, a youth ambassador for numerous education institutions, and previously nominated Cosmopolitan Woman of The Year, Bonita Norris is a beacon of what it is possible to achieve with enough determination. Contraband is the UK’s top booking agent, with friendly, qualified account managers who guarantee you the best deal possible. Contact us today if you would like to book Bonita Norris to be the headline of your event! We as your booking agent are more than happy to help you create the most memorable moments with Bonita Norris.